I am really pleased to welcome you and your child to Class 6! I am confident we are going to have an exciting and enjoyable year, learning new skills and practising old ones. 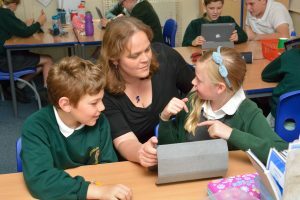 Together with Mrs Dance, we aim to build on the super work that has been done in Class 5. I believe that learning should be fun and we will have lots of giggles and fun alongside learning. Some of the new learning will be tricky and challenging so be prepared for your child to come home saying they are finding some things difficult! A bit about me – I am a Mummy myself to a 6 year old who will be moving up into Year 2 in September (how did that happen!) and I am responsible for ICT and Science within the school. I have been teaching now more years than I care to admit, including many years in Year 6 so I am only too aware of the expectations! Out of work, I play clarinet and saxophone in a band and I love history too. I very much look forward to getting to know both you and your child in the coming months. Class 6’s Learning Expectations Leaflet. This will be given weekly and will include2 or 3 of the following: English, Maths, spellings, Science or Topic. Homework is given on a FRIDAY and expected to be handed in by the following Thursday. In Year 6, greater independence is promoted so we peer and self mark as this enables me to talk to the children about the homework and any issues that may have arisen. Please do annotate any homework to show if you have helped your child, or if your child has found something particularly tricky. 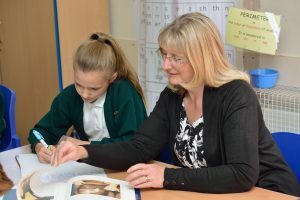 In Year 6, a greater emphasis is placed on your child to take greater control of the reading they do at home. I would expect your child to read a minimum of 3 times a week and their reading journal should be filled in to reflect this. The reading journal is the only way I have of ‘seeing’ if your child is reading, therefore an empty journal would imply no reading is being done at home! Can I ask a parent/carer signs the journal once a week to show you are monitoring the reading your child is doing. I will sign the journal once a week. Each Friday morning your child will put their homework ‘instructions’ into their Learning Journal and write a reflection on their week. I will sign the journal each week – some weeks there may be a comment from myself. It is expected a parent/carer also sign the journal and I will respond to any comments/messages you put in the journal.